featured:: coastal bride "sailboat elopement inspiration"
We couldn't be more tickled to be featured on Coastal Bride today for our sailboat editorial shoot with Ian Riley last August! This was one of my most favorite shoots to plan and design of all time -- not to mention, sailing and styling pretty things in the sunshine is definitely my favorite way to spend the workday! You may recognize a face or two, as well. Our own Associate Planner, Katie, starred as our Bride (along with her real-life boyfriend James as the groom)! See more at Coastal Bride! Other vendors involved: Southern Events Party Rental, The Bride Room, Street Tuxedo, LMA Designs, Katie Russo Beauty. Harbor Island Yacht Club. Southern Weddings Magazine is happy to announce the launch of their newest print magazine, V6 this upcoming Thursday, November 14th! 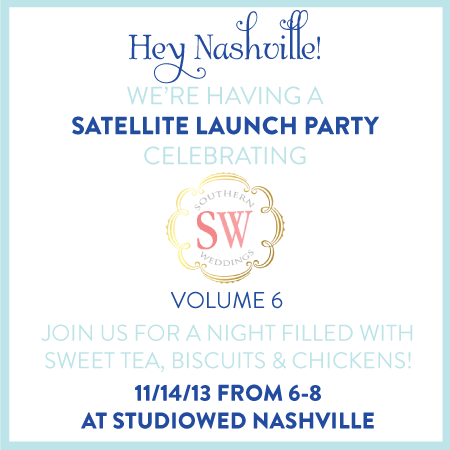 There will be an official V6 launch party in Chapel Hill, NC but since it's a bit of a drive to get there, Amber Housley will be hosting our own satellite launch party right here in Nashville to celebrate the release of the magazine on the same night! The event will be from 6-8 PM at StudioWed in Nashville. All of the details and registration info are on Amber Housley's Eventbrite page. The party is free and open to everyone - from wedding industry vendors to Southern Weddings readers. If you plan to attend, please RSVP on the Eventbrite page. They don't want to give away too many of the fun surprises that will be at the party but there will definitely be sweet tea and biscuits! We are SO excited for this!!! Will we see you there?!!?! ?